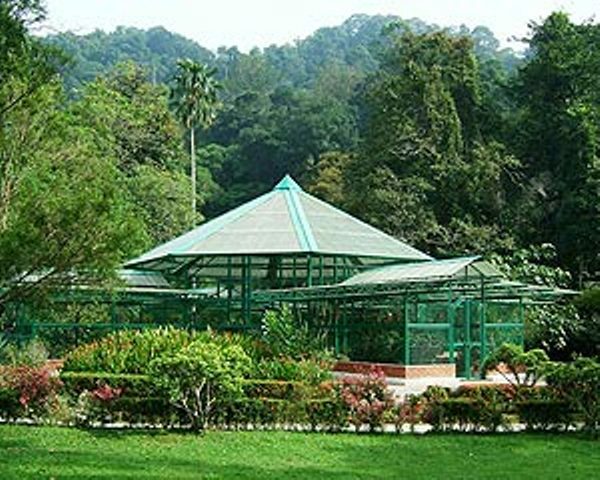 This 30-hectare sprawling garden of flora and fauna is a favourite recreation spot for locals. Central to the Gardens is a waterfall that start over a hundred metres above, hence its more popular moniker of “Waterfall Gardens”. Today, the waterfall is a restricted area and hidden from public view by the green foliage. While the vibrant hues of Penang’s native fauna is the prominent feature, the star attraction is the large number of macaque monkeys that greet visitors from the entrance right to the heart of the garden. Walkers, joggers, runners, picnickers and lovers frequent this gem of a garden for its spacious ans blissful settings. Batu Ferringhi is a popular destination in Pulau Pinang. It situated along the coastal road north-west of Georgetown and lined with a string of international-standard resorts and hotels, extensive dining facilities and fun night shopping! It’s difficult to put a finger on what it is exactly that draws repeat visitors to Batu Ferringhi each year. Like Georgetown, Batu Ferringhi is a great place for visitors to enjoy the good food and great shopping. Batu Ferringhi also has some of the nicest beaches on Penang Island. Unwind on the beach or soak in the sun or while you enjoy a host of aquatic thrills from wind-surfing to canoeing. 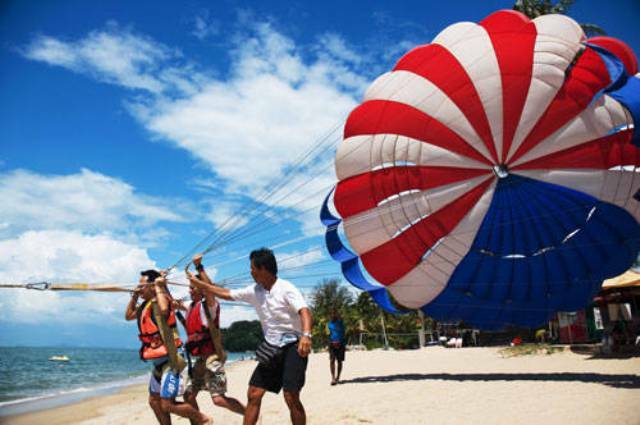 For a spine-tingling adventure, try parasailing to enjoy the view of the beach from the sky. As the sun sets, Batu Ferringhi comes alive with a carnival-like atmosphere with an open-air bazaar selling anything from ornate curios to enticing souvenir items.Watch local artisans demonstrate the intricate art of craft-making and batik-painting. Dubbed the Feringghi Walk, the bazaar offers shoppers a host of attractions. Fort Cornwallis is situated at the spot where Captain Francis Light was supposed to have landed in 1786. It is located close to the Esplanade, next to the Victoria Memorial Clock. Originally a wooden structure, the front was rebuilt between 1808 and 1810 with convict labour. It was named after Charles Marquis Cornwallis, a distinguished Governor General of India, and designed to protect the harbor from possible French attacks. The fort's walls, roughly 10 feet high, are laid out in a star-shape formation. A stroll along the perimeters takes roughly 10 minutes. Inside the fort, you can still see some of the original structures built over a century ago, including a chapel, prison cells, ammunitions storage area, a harbour light once used to signal incoming ships, the original flagstaff and several old bronze cannons, one of which is a Dutch cannon called the Seri Rambai, dated 1603. An interesting note about the Seri Rambai is that some locals believe that this particular cannon can have a positive effect on a woman's fertility. Today, much of the old fort remains, but its precincts have been converted into a public park and an open air theater. 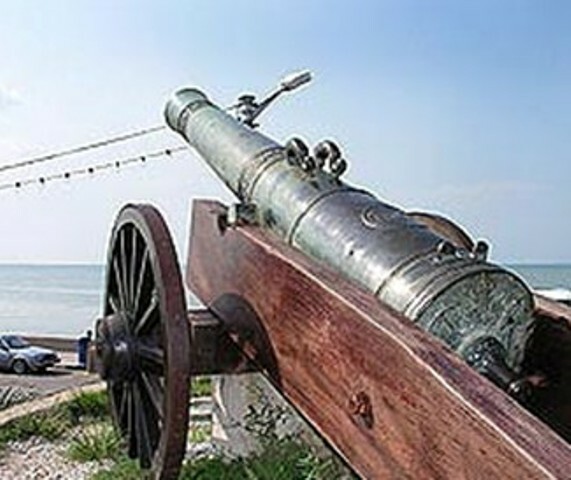 It is still guarded by old cannons, which were retrieved by the British from pirates who had captured them from the Johore Sultanate. 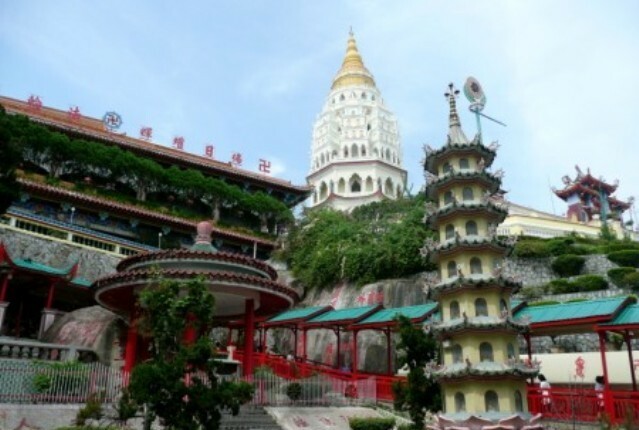 Arguably the largest and most beautiful Buddhist temple complex in Malaysia, the Kek Lok Si temple, which is also referred to as the “Temple of Supreme Billss” or the ‘Pure Land Temple’, covers the expanse of a sloping, east-facing hillside at Air Itam, just to the west of the city of Georgetown. As you walk into the temple’s compound, you will notice large boulders that bear inscriptions of Chinese verses, beautiful sculptures. The serene air and prayers within the temple’s interior. One of the most impressive feature of the temple is the ‘ban Po That Pagoda’ ,or the Pagoda of Ten Thousand Buddhas. As the name goes, this pagoda is made of octagonal tires adorned with quite a number of statues of the Buddha. This pagoda was built in honour of Boddhisattva Tsi Tsung Wang, an enlightened soul who,despite having attained the state, declined to enter Nirvana and chose, instead, to help bring others to salvation. The temple becomes notably busier whenever there is a religious Buddhist festival including Songkran and Loy Krathong. The Penang Bridge is a 13.5km long bridge stretching from Seberang Prai on the mainland to Gelugor on the island, this is one of many architectural wonder in Malaysia. It was officially opened by our visionary Prime Minister, Dato’ Dr. Mahathir in 1985. It ranks as the longest bridge in Asia and 5th Largest in the world. 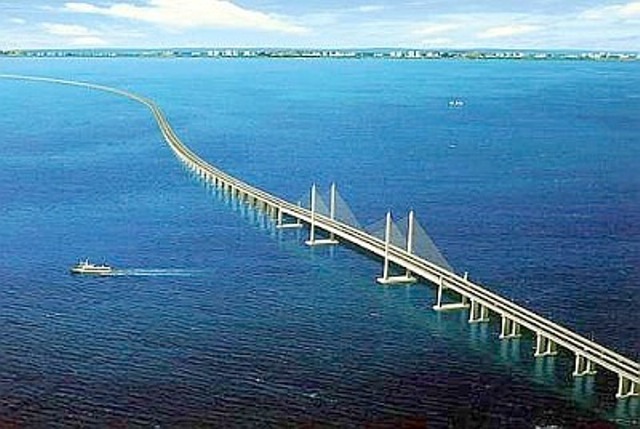 The Penang Bridge costs RM800 million and took five years to build. Before the bridge was built, people depended upon ferry services to cross the Penang Straits. Also known as Bukit Bendera, Penang Hill is the highest peak on Pulau Pinang. At 830m above sea level, it is one of the best places to catch a bird’s eye view of the island’s expanse, including the panorama of Georgetown, the Penang Bridge and the Straits of Melaka. One of the peaks on Penang Hill called Flagstaff Hill, is accessible via a healthy hike up via several hiking trails, including one from the Penang Botanical Gardens. 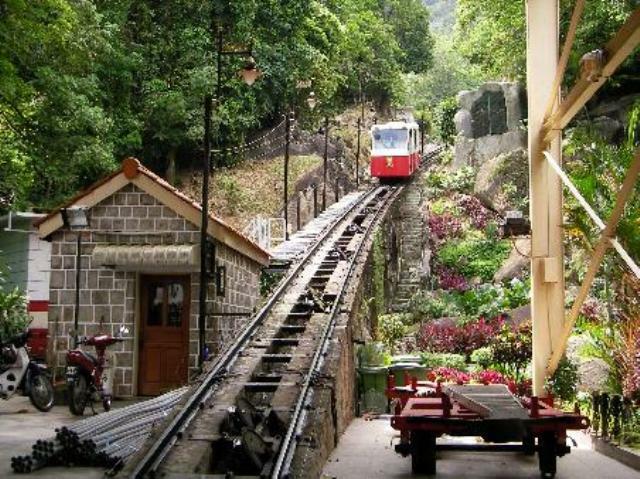 Alternatively, visitors may also opt for a more leisurely trip up via the Penang Hill Railway which stretches just over 2km long and departs from the station at Air Itam, a mere 10 minutes walk from the Kek Lok Si Temple. The 30 minutes ride on the funicular railway takes place every 30 minutes and makes its way up a thrilling, at times near 45 degrees angle, with spectacular visites along the way before reaching the top hill station at 710m above sea level. Along the way, visitors will see a few stately mansions said to date back to colonial times, and at times, troops of monkeys scouring along the route of the train, hoping for visitors to throw out treats to them. Once at the top of the hill, arguably the most popular attraction is the Bellevue Hotel which boasts some of the best views from Penang Hill, a charming garden and aviary. The surrounding parks and gardens here are perfect for photography.